When it comes to planning your wedding cake design, it can be tricky to know where to start. At Mama Cakes, we are happy to guide you through all your options, discus all your ideas, and put forward ideas of our own, to help you create your perfect wedding cake. That being said, in advance of your cake design appointments, it’s always nice to have some ideas behind what you would like, what inspires you and will represent you as a couple perfectly. If you favour minimal and simple design, consider going for an all-white wedding cake. White doesn’t have to mean plain, instead add detail with texture, or white flowers. Connect your wedding cake design to your colour scheme perfectly, but keep the look simple, with colour block tiers. If you’re going for a cake with multiple tiers, choose to have each one or two in a different colour. To add detail and tie the look together, try adding cascading flowers down just one side from top to bottom. If you’re going for a rustic or bohemian style wedding a ‘semi naked’ style wedding cake is perfect. Iced to reveal the inner cake, leave edges raw with the cake exposed to create a rustic finish. Another great way to keep your cake design simple is to opt for a single textured or patterned tier. Traditionally the largest bottom tier would be the focal point, but you can include a statement tier at any level. Keep the other tiers simple, and go for something unique on just one. Wedding cakes don’t necessarily have to be iced from top to bottom. 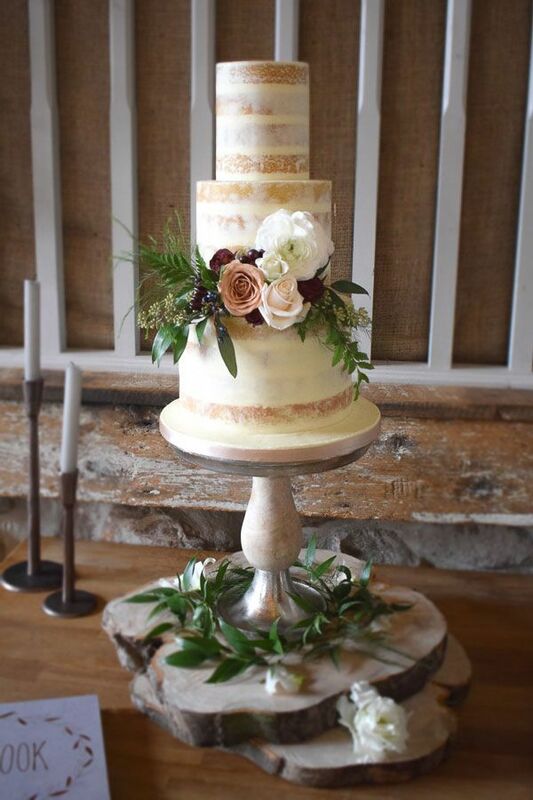 Naked cakes are another great way of creating a rustic look. Keep things simple with cream or frosting between each sponge, and leave this all on view. 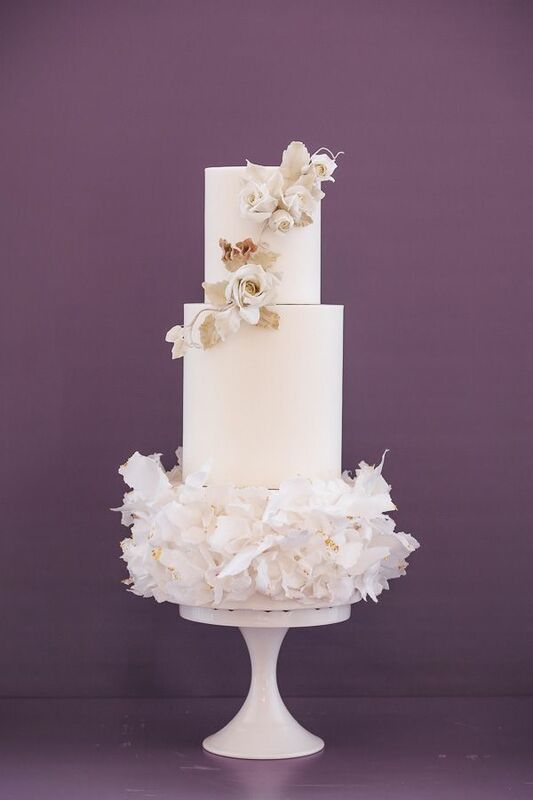 Let the lovely contrast of the warm beige cake and white cream layers become the focal point. Finish with flowers in a single colour palette to add interest and colour. 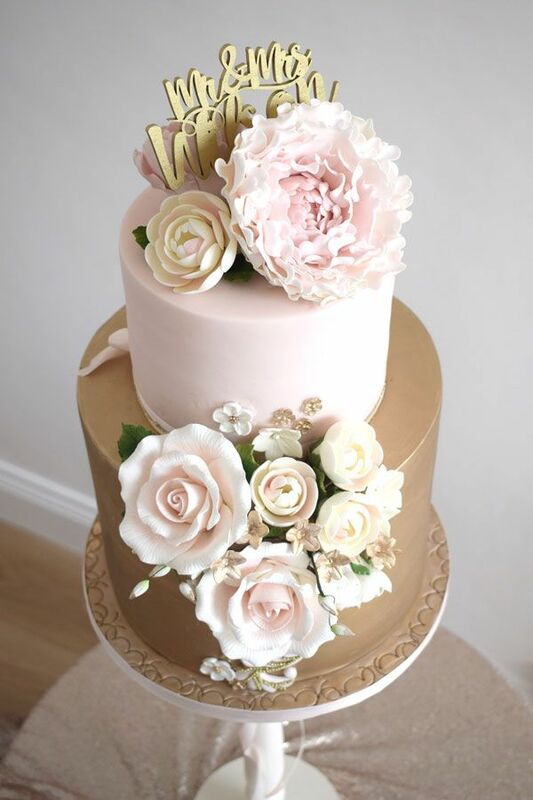 A wonderful organic way to add unique detail is with dripping icing in a contrasting colour. This can be really effective and is a great way to add interest without being too rigid with the design, resulting in a beautiful informal and creative wedding cake. If your wedding dress or stationery have beautiful, intricate lace detailing then this can be used as inspiration for creating hand-piped floral patterns around your cake. Hand-piped lace provides a luxurious and sophisticated visual impact which can enhance any cake design. Another beautiful organic design is to allow floral arrangements to take centre stage. Flowers are a wonderful way to add that wow factor, and present the perfect way to add colour to otherwise neutral designs. From single oversized blooms, to cakes adorned with flowers and foliage from top to bottom, flowers will add that all important finishing touch. Add a touch of glamour and a luxury feel to your cake, with metallic details. 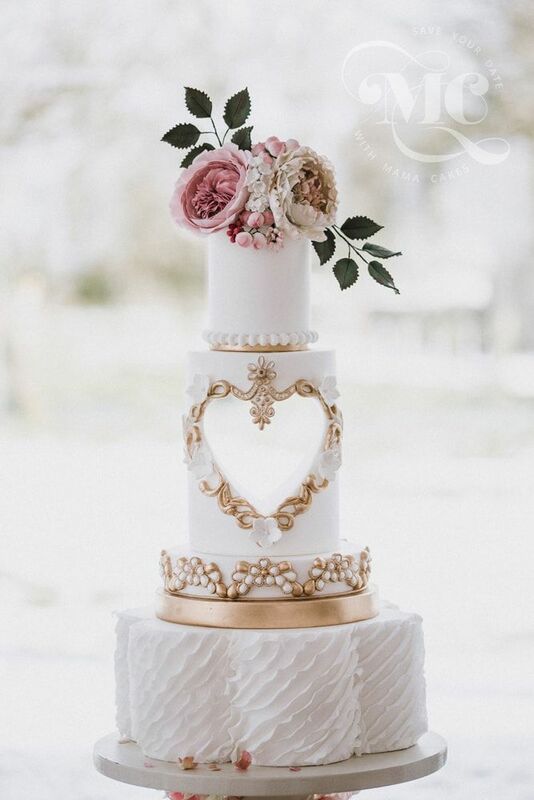 From piping and lettering, to all over glitter and metallic finishes, metallics provide a wonderful way to create a unique wedding cake design. Try silver and gold, or copper and rose gold, play around with the idea of introducing metalics and be creative with your design. Much like wedding cakes don’t have to be iced, they also don’t have to be white. Whether you want to match your colour scheme, or you have unusual colours in mind for your wedding cake, there are no rules and you can be as bold as you like when it comes to colourful cakes and details. There are loads of ways in which you can create your perfect wedding cake, using clever design ideas to create a look that’s unique to your big day. To start discussing your ideas get in touch. 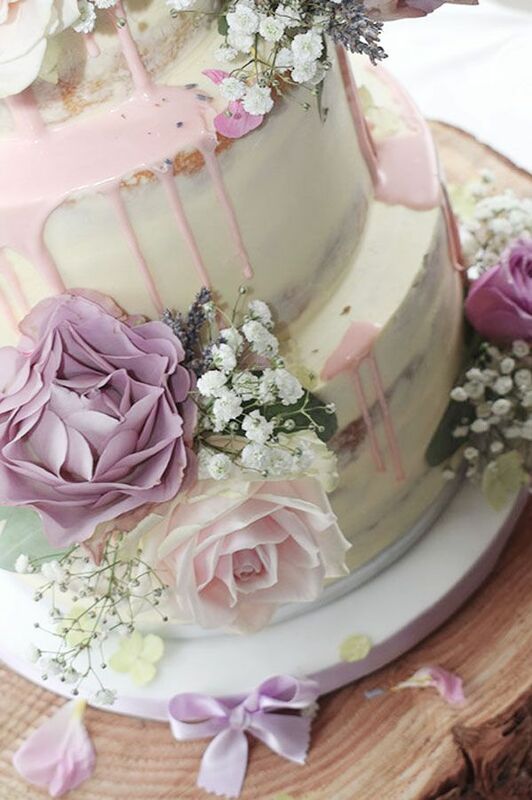 At Mama Cakes, we provide wedding cakes to Cumbria and the surrounding areas, and love helping you come up with your perfect wedding cake design.